Calidorus: Take these letters, then tell yourself what misery and concern are wasting me away. As the above extract shows, Old Roman cursive was considered difficult to read and roundly mocked even in its heyday, and is now considered almost illegible; the current cursive form of the Latin script has accordingly evolved beyond recognition. The script uses many ligatures, and some letters are unrecognizable – "a" looks like an uncial "a", but with the left stroke still straight, "b" and "d" are hard to distinguish, "e" is a full height letter (like the "s"), "p" and "t" are very similar, and "v" is written above the baseline, resembling an inverted chevron. 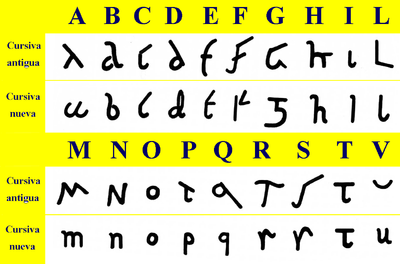 New Roman cursive, also called minuscule cursive or later Roman cursive, developed from old Roman cursive. It was used from approximately the 3rd century to the 7th century, and uses letter forms that are more recognizable to modern readers; "a", "b", "d", and "e" have taken a more familiar shape, and the other letters are proportionate to each other rather than varying wildly in size and placement on a line. These letter forms were in part the basis for the medieval script known as Carolingian minuscule, which was developed at Aachen and in Tours in the 9th century and propagated throughout Charlemagne's empire in a deliberate attempt to unify handwriting, and whose revival in the Renaissance, after it had evolved into the relatively illegible blackletter and fallen out of use, forms the basis of our modern lowercase letters. The uncial and half-uncial scripts also most likely developed from this script; "a", "g", "r", and "s" are particularly similar. According to Jan-Olaf Tjäder, new Roman cursive influenced the development of not only uncial, but of all the other scripts used in the Middle Ages. Gaelic type is an example of a later usage of uncial. ^ Jan-Olaf Tjäder, (Lund, 1955).